An article originally published in the June 2005 edition of "Techniques In Orthopaedics" (Volume 20, Number 2). Licensed and reprinted with the permission of Lippincott Williams & Wilkins. Orthopaedic surgeons planning to work in a developing country will undoubtedly be exposed to chronic osteomyelitis. 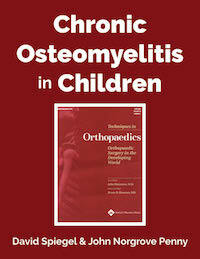 In children, the disease usually results from untreated acute hematogenous osteomyelitis. Chronic osteomyelitis may also be seen after traumatic injuries, especially in times of civil unrest or war, or as a complication of surgical procedures such as open reduction and internal fixation of fractures. The long bones are affected most commonly, and the femur and tibia account for approximately half of the cases. Predisposing factors include poor hygiene, anemia, malnutrition, and a coexisting infectious disease burden (parasites, mycobacteria, acquired autoimmune deficiency syndrome), or any other factors that decrease immune function. Chronic osteomyelitis is defined by the presence of residual foci of infection (avascular bone and soft tissue debris), which give rise to recurrent episodes of clinical infection. Eradication of the infection is difficult, and complications associated with both the infection and its treatment are frequent. Our goals are to review the pathophysiology, natural history, and treatment options for children with chronic osteomyelitis within the context of a developing world setting. Indonesian translation by Rahmat Husein. Russian translation by Nataliia Moskalenko.